Hi everyone. 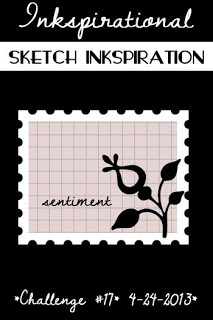 Today my card is for the latest challenge at Inkspirational - Challenge #17 - Sketch. I LOVE this CAS sketch and plan on making a few cards using it. This card was super quick and easy as I used up some leftover images I had on hand. 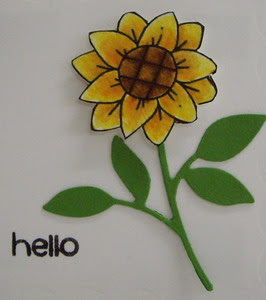 I colored several of these sunflowers when I made a card a few days ago and I always keep extras handy just in case they fit something I want to make ... so happy to actually take something out of my leftovers box ... I usually am just adding to it! :) Hope you like. I colored the sunflower using the marker layering technique (ink and blender pen). I fussy cut it out and popped it up with a dimension on top of the stem to give the flower some depth. Beautiful, love that single bloom. Oh I loooooooooooooove it Loll. Gorgeous. Love it! It's making me think I need the postage stamp Nesties! I love using something out of my scrap / leftovers box! 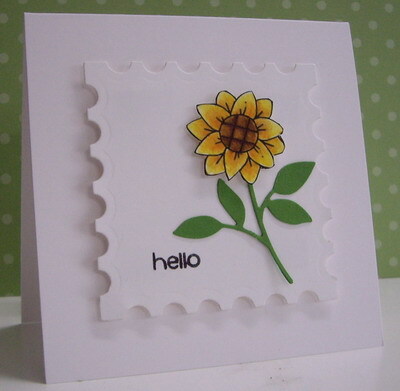 How fab to use up some stash and make such a great card. I love the colouring. Thanks for joining us at Inkspirational. Loll I love this! Sunflowers are such fun flowers to me. They just always put a smile on my face. I love that die cut panel too! Thank you for joining us at Inkspirational this week! This sunflower is so pretty as a single! Perfect for this sketch!